Sacrifice of Love: On the Bookshelf: Childbirth Books Everywhere!!!! On the Bookshelf: Childbirth Books Everywhere!!!! Hello there! Last night, my husband and I (and Baby) had our first childbirth class!!! Woohoo!!!! I'm really, really excited. Reading about childbirth is fun, but sitting in a room with other couples and having a cool lady teach about childbirth is even more fun! In honor of 21 weeks gestation (so Baby is 19 weeks old already! 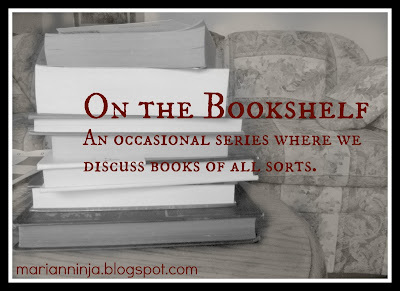 ), I'd like to do a special Pregnancy Edition of On the Bookshelf. I have been reading loads of books on childbirth, and I think it'd be nice to sort them out in one place. So, if you are interested in childbirth books, if you're curious to see what I've been reading, or if you have some recommendations, then come right along! Husband-Coached Childbirth (fourth edition), by Robert Bradley. I've talked about this in a previous literature post, so I won't elaborate here. In a nutshell: I liked reading through the concept of the husband being the labor coach, and I think there are many good ideas to draw from this book. It was a bit heavy on the anti-medication stance in my opinion, which could be due to the fact that this is a fairly old book. I liked it, but I take some of the elements with a grain of salt. Natural Childbirth the Bradley Way, by Susan McCutcheon. I admittedly skimmed parts of this book, because some of the information overlapped with that of Husband-Coached Childbirth. This book seemed to be a bit more reader-friendly in how it was organized and flowed, with photos and diagrams added in. I think the addition of photos was my favorite part of going through this book; instead of just reading about positions and postures in Bradley's book, I could actually see photographs and diagrams! Super helpful!!! Ina May's Guide to Childbirth, by Ina May Gaskin. After talking with several people and reading through this book myself, I find it no surprise that this is one of the "must-read" books on natural childbirth out there (seriously, I had so many moms recommend this to me!). What I really loved was that this book features multitudes of birth stories, which convey that each birth is different, each woman is different, but every birth can be an incredibly beautiful experience. This book emphasizes that labor does not have to be gauged in terms of "pain," but that other words (like "intense") can more fully describe what's happening-and that this, in turn, helps the mother psychologically. Besides all of the empowering birth stories, there is lots of practical information about labor and childbirth in the second half of the book. I highly recommend this! Spiritual Midwifery, by Ina May Gaskin. This is a bit similar to the other Gaskin book, except there are more birth stories, diagrams, and general bits of awesomeness about childbirth. In this book, I really felt the hippie roots a lot more strongly, too. I think it's important to know, for context purposes, that "The Farm" which Ina May works & lives on, began as a hippie commune (which was led by Ina May's husband). While reading this book, I devised an excellent Pregnancy (Water) Drinking Game: Each time you read the word or phrase "psychadelic," "smooched," or "I felt high," take a drink of water. Trust me, after just a handful of pages, you will be incredibly well-hydrated! While there is some weird-hippie-spiritual stuff that goes on in some of the birth stories, I still really liked this book a lot. The Birth Partner, by Penny Simkin. Wow, this book was thorough! I actually was not able to finish reading it, because there was so much in it, some of which doesn't necessarily apply to me at this point. Yes, this book is helpful for doulas and husbands, but it is also really helpful for the pregnant mothers. In a very organized fashion, it objectively goes through the latter months of pregnancy, the different stages of labor, the different medications and interventions available, different positions (with diagrams of the positions)...even more stuff that I can't remember off the top of my head. This is basically a very comprehensive, objective, "You are going into labor. Here is a book about everything." This one did not seem to have as big focus on natural labor specifically, but seems like it would be helpful for anyone in any situation. I liked it, but there was a lot to take in. I'll probably have to check it out again in a couple months! Active Birth, by Janet Balaskas. Before I ever got pregnant and started reading about labor, I knew that I would prefer to give birth in an upright position if possible. Even though I hadn't read about it, this made the most sense to me-gravity works with you and the baby, not against you. I picked up Active Birth, and it made even more sense! This book has pages of photos and descriptions of helpful pregnancy exercises and stretches, which is great-but the part that I liked even more was the focus on birthing upright. With more photos and descriptions, it discusses how a woman can give birth upright, and the benefits of it. How cool is that??? I really liked this book, and I recommend it! As I read each book, I became more and more excited for childbirth. I think that learning about childbirth is super important. God made our bodies in such a brilliant way, so that women can naturally birth out their babies. We shouldn't be afraid of childbirth or dread it; it's a really incredible, cool, miraculous process! Yes, there's typically a bit of pain, discomfort, and lots of intensity involved, but it doesn't have to be a jaw-clenching, monstrous experience every single time. Learning about the interaction of hormones with contractions (or, as the hippies say, "rushes") is really fascinating, too! If any of y'all have books on childbirth that you recommend, I would love to hear about them! Thanks for joining me! Midwife, something like that. It was in the same section in the library as the Ina May books. Just a bunch of birth stories told from the perspective of the midwife. Lots of fun reading! Congrats on finding out that you have a little boy! I love that shirt and the sign and ahhh everything about it. I had a dream once that I was pregnant and about to give birth, and I thought the whole pregnancy / my whole life was a failure because I didn't read any books, haha. I woke up and was like, "... I need to make a mental note to read a childbirth book when the time comes..."
Hello! Sam and I are beginning to do some "research" on the birth process as well - when I say research, I mean glancing over blogs online to gather a quick bit of multiple perspectives. Gotta admit, trying to avoid the subject, but I'm finally to the point where I figure, "Well, gonna happen - let's make it great." Thanks for this post to refocus my mind a bit. If there were one book you would suggest Sam and I read together, which one would it be (if you can pick just one)? I don't want to overload my brain too much, if that makes any sense. If I could pick just one book to recommend, I think it kind of depends on what you and Sam want/need at this moment. If want to grow in confidence and mentally prepare yourselves for the birthing process, I highly recommend reading either of Ina May Gaskin's books. The information about the birth process is helpful, but I also found it extremely helpful see that "Oh, if this hippie could give birth under a tree, I can totally give birth, too!" Reading so many stories of women who had unmedicated (sometimes painless, or even orgasmic!) labors was eye-opening and very empowering. If you and Sam are looking for something that hits more practical notes of pregnancy exercises & birth positions, I highly recommend "Active Birth" by Balaskas. And, if I remember correctly, this book even talks about ways to be active if you use meds during labor. Also, I don't know if you two have looked into or thought about childbirth classes at all, but I really recommend looking into it. Book-knowledge is great, but so far (we've only had one class, so we're not far along), being with an instructor and other couples who are learning to prepare for childbirth has been really helpful for both of us. If you are interested in childbirth classes, I recommend looking into those sooner rather than later, because the months will fly by, and some of the courses are a bit lengthier (we're in a 12-week course). Wow, Taylor, sorry that was such an elongated response! I hope it helps, and that you both find whatever works best for the three of you. Feel free to call or text me if you have any other questions, or if you want to chat or need encouragement or anything! This is great! Thanks for giving me your thoughts! We will head in the direction of Ina May Gaskin. Oh yay! A boy! SO exciting! We are discussing if we'll find out the gender of our baby next month!